3 Things To Know About Louisville's Basketball Championship : The Two-Way Coach Rick Pitino did something no one else has done. So did one of his players, Luke Hancock. Now Louisville has a chance for a rare double: The school's women's team plays for a national championship Tuesday night. The Louisville Cardinals celebrated after beating Michigan 82-76 in the NCAA Men's Basketball Championship at the Georgia Dome in Atlanta. 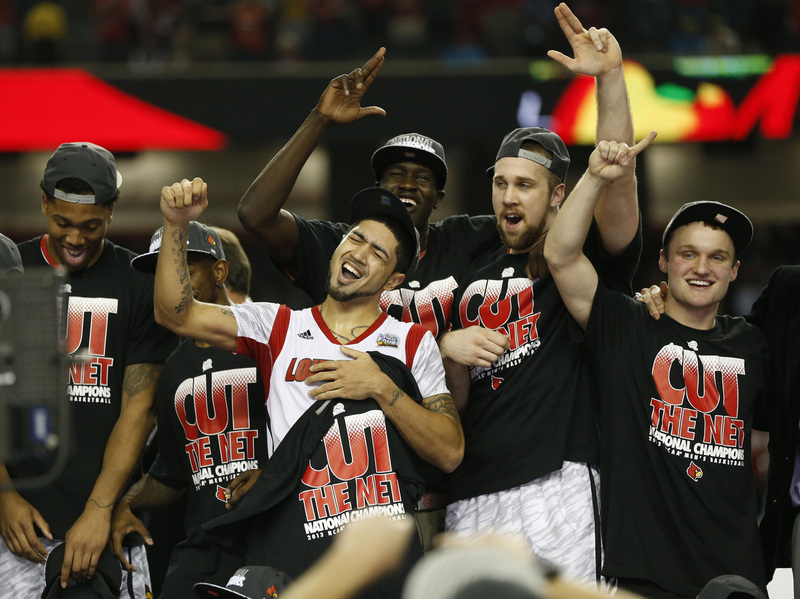 By beating Michigan 82-76 Monday night in Atlanta, Louisville won this year's Division I men's basketball championship. -- Louisville's Rick Pitino became the first coach to earn national titles at two schools. He led Kentucky to the championship in 1996. It's been quite a week for Pitino. He also heard that he's among the 2013 inductees at the Naismith Memorial Basketball Hall of Fame. -- Louisville's Luke Hancock, a junior who sat out the 2011-12 season after transferring to Louisville from George Mason, made history. He's the first non-starter to be named most outstanding player in the 75 years the tournament has been played. As ESPN writes, Hancock "scored 22 points off the bench in Louisville's 82-76 victory over Michigan on Monday night. ... [He] didn't miss a 3-pointer, making all five attempts. He was money at the foul line, making 7 of 10. He didn't turn the ball over. He also scored 20 points in Saturday's semifinal victory over Wichita State, making three 3s." -- Louisville also got a superb performance from senior point guard Peyton Siva. "Going head to head with National Player of the Year Trey Burke of Michigan," reports the Louisville Courier-Journal, Siva "had 18 points (14 in the second half), six rebounds, five assists, four steals and only two turnovers as the Cardinals prevailed 82-76." One more thing you might want to know: Louisville's Kevin Ware, who broke his leg during the tournament, got to help cut down the net after Monday night's victory. There was more about Louisville's win on Morning Edition. And WFPL reported about the post-game celebrations — and some arrests — in Louisville, Ky.
Now, as we said Monday, Louisville has a chance for a rare double. The school's women's basketball team plays for the national championship Tuesday night in New Orleans. The Connecticut Huskies are favored to win, but the Lady Cardinals pulled off a big upset earlier in the tournament when they beat Baylor. The only time teams from the same school have won both the men's and women's championships in the same year was in 2004, by UConn. The women's game airs at 8:30 p.m. ET on ESPN. Watch for a preview from NPR's Tom Goldman later today.